This Gourd Kills Cancer Cells, Reverses Diabetes, STOPS Gout, And Cures Asthma! The bitter gourd (also known as bitter melon) looks like a cucumber but with ugly gourd-like bumps all over it. As the name implies, this vegetable is a melon that is bitter. There are two varieties of this vegetable: One grows to about 20 cm long, is oblong and pale green in color. The other is the smaller variety, less than 10 cm long, oval and has a darker green color. Both varieties have seeds that are white when unripe and turn red when they are ripe. The vegetable-fruit turn reddish-orange when ripe and becomes even more bitter. Bitter gourd thrives in hot and humid climates, so are commonly found in Asian countries and South America. Unfamiliar with the bitter, Westerners can find bitter melon difficult to consume. But if you can handle the bitterness, you will be able to enjoy the health benefits of the bitter gourd. Try it, at least for all its healthful virtues! Bitter gourds are very low in calories but dense with precious nutrients. It is an excellent source of vitamins B1, B2, and B3, C, magnesium, folate, zinc, phosphorus, manganese, and has high dietary fiber. It is rich in iron, contains twice the beta-carotene of broccoli, twice the calcium of spinach, and twice the potassium of a banana. Bitter melon contains a unique phyto-constituent that has been confirmed to have a hypoglycemic effect called charantin. There is also another insulin-like compound known as polypeptide P which have been suggested as insulin replacement in some diabetic patients. There are few other fruit or vegetables that can offer the medicinal properties for the following ailments quite like bitter melon does. 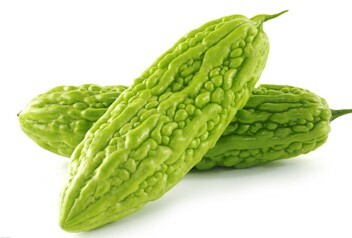 Bitter gourd treats blood disorders: Bitter gourd juice is highly beneficial for treating blood disorders like blood boils and itching due to toxemia. Mix 2 ounces of fresh bitter gourd juice with some lime juice. Sip it slowly on an empty stomach daily for four to six months and see improvement in your condition. Bitter gourd helps kill cancer cells: Bitter gourd juice contains an enzyme that inhibits the transportation of glucose (sugar), thus lowering blood sugar levels, cutting off the food supply to cancer cells, retarding their growth. Bitter gourd can stop cholera: In early stages of cholera, take two teaspoonfuls juice of bitter gourd leaves, mix with two teaspoonfuls white onion juice and one teaspoonful lime juice. Sip this concoction daily till you get well. Diabetes Mellitus: Bitter melon contains a hypoglycemic compound (a plant insulin) that is highly beneficial in lowering sugar levels in blood and urine. Bitter melon juice has been shown to significantly improve glucose tolerance without increasing blood insulin levels. Bitter gourd to boost your energy levels: Regular consumption of bitter gourd juice has been proven to improve energy and stamina level. Even sleeping patterns have been shown to be improved/stabilized. Eye problems: The high beta-carotene and other properties in bitter gourd makes it one of the finest vegetable-fruit that help alleviate eye problems and improving eyesight. Bitter gourd can stop gout: Bitter gourd juice is liver cleansing. It helps clean up a toxic blood, improves blood circulation and relieves gout pain. Bitter melon is a genuine hangover cure: Bitter melon juice may be beneficial in the treatment of a hangover for its alcohol intoxication properties. It also help cleanse and repair and nourish liver problems due to alcohol consumption. Drink bitter gourd to boost your immune system: This bitter juice can also help to build your immune system and increase your body’s resistance against infection. Piles: Mix three teaspoonfuls of juice from bitter melon leaves with a glassful of buttermilk. Take this every morning on empty stomach for about a month and see an improvement to your condition. To hasten the healing, use the paste of the roots of bitter melon plant and apply over the piles. Psoriasis: Regular consumption of this bitter juice has also been known to improve psoriasis condition and other fungal infections like ring-worm and athletes feet. Read: a great Psoriasis remedy. Respiratory disorders: Take two ounces of fresh bitter melon juice and mix with a cup of honey diluted in water. Drink daily to improve asthma, bronchitis and pharyngitis. Bitter gourd to combat Toxemia: Bitter gourd contains beneficial properties that cleanses the blood from toxins. Sip two teaspoonfuls of the juice daily to help cleanse the liver. Also helpful in ridding jaundice for the same reasons. Choose unripe bitter melons that are firm, rather like a cucumber. Avoid those that have turned orange or have soft spots. Ripe bitter melons can be excessively bitter. Store bitter melons in the vegetable bin in the refrigerator to prolong there shelf-life. It should keep for three to four days. Keeping bitter melons at room temperature or close to other fruit and vegetables will speed up the ripening process (due to the emission of ethylene gas) making them more bitter. Clean your bitter melon under cold running water and brush with a soft vegetable brush. To prepare, slice the melon length-wise and scoop out the seeds. To lessen the bitter flavor, soak it in salt water for about half an hour before juicing or cooking. The smaller variety is even more bitter than the larger variety. To make bitter gourd juice more palatable, add a teaspoon of honey, or add another fresh juice such as carrot or apple juice. For diabetics, drink the juice with green apple juice. Choose a bitter gourd that is of light green. The bigger and lighter-colored ones are less bitter. Store unused bitter melons wrapped up in a plastic bag and keep in the fridge for up to 3-4 days. Note that the longer you keep the gourds, the more bitter it may become. Slice the melon length-wise and remove the seeds. Then cut it to smaller pieces to fit your juicer feeding chute. Drink about 2-3 ounces every day and you should be seeing an improvement in about 2-3 weeks. If you like it bitter, you may add one green apple to the bitter juice to make it more palatable. Drink this regularly and try to avoid high intake of sugar in food, reduce meat, fried foods and eat more raw vegetables. Are there any side effects to consuming bitter gourd? Drinking more than 3 ounces of bitter gourd juice may cause mild abdominal pain or diarrhea. Diabetics taking hypoglycemic drugs will need to alter the dosage of their drugs if they consume bitter melon on a regular basis. Please consult your doctor. Pregnant women should avoid taking too much bitter gourd or its juice as it may stimulate the uterus that can lead to preterm labor. Can I cook or boil bitter melon? If you boil bitter melon in water and drink it, you will still benefit a lot from its minerals and phytonutrients as they will leach into the water that you drink. However, you will lose the vitamins and enzymes as they get destroyed in heat. Really works!! I was very surprised when I saw my sugar lower from 195 in the morning to 95 after eat bitter melon (I cooked and mixed with very lean ground beef). It is a great help to lower sugar level, and it proved to me. I discovered the benefits of bitter gourd in lowering blood sugar levels, the hard way. I had an innocent (I am not diabetic) glassful of the juice that was being sold at the ‘laughter club’ site. A while later I got dizzy. Apparently my sugar level had dropped. The proof of the pudding! I take it daily with coriander leaves in the morning. My pimples and psoriasis has gone. I am impressed. My Mom is diabetic and she had been experiencing sharp pains in her feet and legs. In the middle of the night she would have to get up because of the intense pain, the pain would make her cry, could hardly walk, and would have to ice her feet and leg for 30 to 45 minutes each night. During the 3 week process of her intake of Bitter Gourd (Melon), she has been sleeping through the night with no pains, no pains during the day, she says that she feels much better. Her sugar levels are low and stable. The Bitter Gourd Juice had improved her conditions just after 2 days of taking it. Its been 3 weeks going onto 4. It has been a great help to her condition. Just started today bought the bitter melon juice, have been diabetic since 2007, experiencing eye problems that don’t seem to get better. Bitter melon came highly recommended to me, I hope it helps. Is it okay if I boil bitter melon pieces in water, and then drink the water regularly? Or will boiling kill the nutrients? Please advise. This melon is working a lot. I just cut it and put in my 1LT bottle. I drink it over and over, no more pain. I was having strong back pain, even my legs were swollen now I’m free! It was recommended by a pharmacist. I’m seeing a lot of improvement in lowering the blood sugar as prediabetes. Blend with fresh ginger and mix up with lemon juice enjoy every morning in the empty stomach. We eat this is as a salad. Cut into two lengthwise, scrape out the seeds. Then cut into thin slices. Add salt, lime juice, sliced red chillies and sliced red onions.You can add in cilantro as well. We eat them with rice and other dishes. Delicious! This sounds like a great recipe. I will definitely try it. Thanks for sharing! You can cook karela also. Cut them into small bite-sized chunks. Put 3 to 4 tea spoons of olive oil in a pot and add a teaspoon of black mustard seeds, and heat in medium heat until you hear mustard seeds crackling. Lower the heat to bare minimum. Add 1 teaspoon of urad dhal, a pinch of ground red pepper, half tea spoon of yellow turmeric powder. When the urad dhal becomes brown, add the cut karela and saute with continuous stirring with a spoon. Add 3 to 5 tea spoons of crushed tomatoes or sliced tomatoes, continue to saute. Add sea salt to taste. Add 2 to 3 teaspoons of Indian masala paste. Simmer for about 15 minutes until the karela is tender, but not too soft. Add about 5 stalks of chopped coriander leaves. Enjoy with cooked rice. You can also add 2 teaspoons of organic lemon juice while simmering for a different taste. 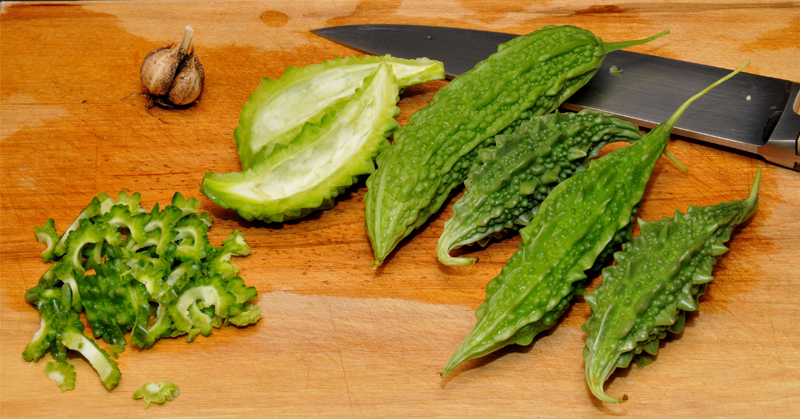 Enjoy the benefits of karela, but with less bitter taste! I have been following up on your recipes they are of great help however my husband has been having persistant hiccups for like six months now. He was diagnosed with H-pylori and has taken the medications but he still has the hiccups. Kindly advice on the juice that will help to clear this. Your assistance will be highly appreciated. This is great. My mother after having long sickness, they discovered that she has diabetes and pressure. Later on I had eyesight problems only to discover I also had diabetes. A friend told me about bitter gourd which I got for my self and my mother. Our sugar levels have drastically improved. I HAVE FOUND BITTER GOURD JUICE USEFUL IN INDUCING SOUND SLEEP. IT HELPS CURE INSOMNIA AND HELPS FIGHT DEPRESSION.